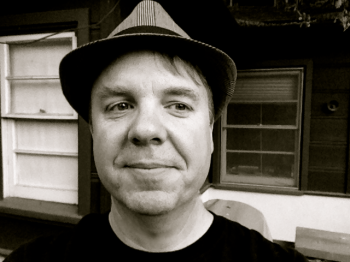 On April 5 I was in Novato, California, in a conference room at the tiki-themed studio called Toys For Bob. I was playing the latest build of what we now know as the Sypro Reignited Trilogy, and revisiting my life from 20 years ago, when I was part of the team that created the original PlayStation 1 games. What I didn't know was that at the moment I was playing, an announcement had gone out to the public officially confirming for the first time the existence of Spyro Reignited. When I went to lunch with the team, there was a strange energy. They looked dazed, a little edgy, and they were referring to specific fans and their reactions. I thought about looking at Twitter on my phone, but decided not to. When the Spyro the Dragon project began in 1997, I was just turning 30 years old, and had not done much. Enough opportunities came my way to pay the rent, but nothing had really clicked. This changed when a freelance recruiter called me, said he had come across my business card, and wanted to talk to me about an opportunity. I said sure, why not. A week or so later I was on the backlot of Universal Studios, sitting in the office of Mark Cerny, trying to cope with the fact I was talking to the creator of Marble Madness. A few weeks after that, I was driving my Volkswagen through the gates at Universal to start work. Universal had a unique relationship with a couple of game developers: Naughty Dog and Insomniac. Both were located on the backlot, much like a film production company would be, and we became closely enmeshed with them. I began doing some level design for Insomniac on their first game, Disruptor. A couple of years later, I started playing a meaningful part in building Spyro the Dragon. Spyro changed my life. The little purple dragon, and the team that brought him into being, gave me focus. I bruised my knees trying to sort out Spyro's quadruped mechanics, and started drawing what would be the early levels of the game. As the production picked up momentum, our very small team began producing a very large project, and I got even busier: I did sound editing, wrote a bit of dialogue, and worked with Stewart Copeland on the soundtrack. There comes a point in a creative process where you feel like you aren't creating things anymore, but rather uncovering them. This is particularly true when working with a gifted team and a clear vision. By the time we were bringing Spyro to life, I was beginning to live in Spyro's world, discovering what might be through the next portal, obsessed with its contents. Some months into production we learned that Sony wanted to release Spyro to coincide with the anniversary of the PlayStation's launch. The release date couldn't move. For more than two months, I worked seven days a week. I would come into the studio at odd hours, in the early morning or on weekends, so that I could be running builds on idle Silicon Graphics machines as I moved a gem here, or an enemy there. The rest of the team worked with the same fervor. There's an energy to producing something that you really believe in. I didn't pause to think of why I believed in it so much, but I loved the game and I loved the people I was working with. I wanted it to be perfect. After the first game came out, two more years were spent feverishly making more of Spyro's world. Two sequels followed, each released exactly a year apart. Each increased in scope and ambition (arguably too much, on the third game). I had designed a couple dozen levels, placed more gems than I could count, and been completely immersed. I used to joke that every level I designed took a month off of my life expectancy. It was hard as hell, and it was the best time of my life. "We hope you have enjoyed the Spyro Trilogy! We had four great, fun, sleepless years creating it." Spyro is a unique mascot character in that he is clearly and unabashedly a child. While characters tend to be ageless (Mario, Crash) or aspirationally cool (Sonic), Spyro is frozen in that magical space between innocence and experience. 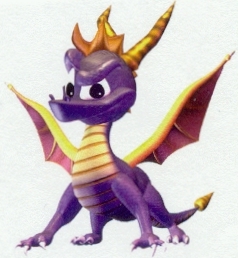 It was this Spyro that so many human children - many of them quite young - immediately formed a lasting bond with. The three-game trilogy is Spyro's journey through adolescence. He first comes to grips with a changing relationship with adults, then understands the importance of friends, and finally explores alternative identities and the impending confusion of romantic relationships. Spyro's adventures are difficult and filled with failure, but the games are in their own way quite forgiving. They eschew the one-hit kill common in the genre in favor of a hit-point system managed by Spyro's familiar-spirit, Sparx. The most notable challenges involve not Spyro's death, but a gentler form of failure like the notorious thief chases or "trouble with the trolley." I'd love to say this was carefully planned, but it really wasn't. It felt like as we got our bearings in the dragon universe, more complexity and ambiguity ensued. It was a reflection of how the creators grew to trust and even love each other as we gave the purple dragon more worlds to find and more folks to meet, and its players a little more (but not too much more) to think about. Little wonder, then, that those children of the late 1990s would become attached and so enamored with the re-imagined trilogy. It represents a chance not only to go back to one's own magical time in life, but poignantly, it is often a reminder of an experience of safety and comfort for children whose worlds sometimes offered neither. The lovely thing about video games is that the stories and worlds and characters are not merely shown, but are experienced, making for a nostalgia that is played out in the first person. It's sticky, and it's powerful. When something big in your life ends, especially if it ends when you're fairly young, you often don't really notice. Insomniac went on to develop what would become the wonderful Ratchet & Clank games. Mark Cerny and I decided to form a company and work as independent consultants, which we did successfully for a few years. I was young enough to still feel like the best was still in front of me. I left that life, and a certain purple dragon, behind. To this day, I have never played Spyro: Enter the Dragonfly, the sequel that Universal created without Insomniac or Mark or myself. I understand it's not very good. Throughout the intervening 20 years, I have rarely spoken about Spyro. My wife, also a member of the game industry, did not realize I had worked on it until we had known each other for more than three years. I carefully omitted Spyro from most of my talks and lectures. Spyro was part of my past, and I felt it was best to keep it that way. I broke my rule once at a talk I gave in Michigan in 2012. I was encouraging game developers to get outside more and see more of the world, and showed an example of how traveling in Southeast Asia as a young person had inspired some level design I'd done for the games. After the talk, I was confronted by several people who wanted to talk about Spyro. One even wanted an autograph and selfie. I found it very uncomfortable, and it reaffirmed my policy to keep my work on Spyro secret. In April though, my past came rolling back in a way I couldn't ignore. I was helping Toys for Bob reimagine (as best as I could recollect) some of the behaviors and designs from the original games. It was fun, and the Toys for Bob team was great to collaborate with. They understood that Spyro was, above all else, a game about heart, innocence, and a world that makes sense - maybe providing a little bit of contrast to our real world. Spyro is forever the child we all wish we could have been, in worlds that we'd all love to visit. This is what is so special and unique to these type of video games, which cannot be experienced any other way. When I got home late in the evening after my visit to Novato, I decided to look at Twitter to see people's reactions. Multiple people, adults in their early 30s, were recording videos of themselves watching the release trailer. They were crying. "Oh my god, my childhood" and "Spyro was where my sisters and I went to feel safe when the world around us was crazy." The most common YouTube comment was "I'm not crying, you're crying." You're right, YouTube commenters: I was crying. I was glad the family had gone to bed, that I was alone in my darkened kitchen. I didn't need anyone seeing me like this. As I watched those crying YouTubers, and read the Tweets, and as a 50-year-old in a suburban kitchen, I was right there with them. I was mourning a loss that I had never quite processed, and maybe I never really will. Very few of us are so lucky to have been deeply involved in something so special, and that is a gift. But trust me, young Twitter friends, you don't miss Spyro half as much as I do. I've shed tears a few more times over these past months, as I've ridden the emotional wave that is the Reignited Trilogy. They are tears of melancholy, yes, but also of joy, a sort of relief that this thing I was once a part of means so very much to so many. On a later visit to Toys for Bob, as I played through Colossus, one of my favorite level designs, I paused for a moment and just watched. Then I closed my eyes, and remembered that there is a place where control is perfect, where the boundaries are known, where Stewart Copeland's soothing music is on endless repeat, and where everything, at least for a while, will be OK.
Michael John is a professor at UC Santa Cruz, where he teaches game design and development.